Today isn’t the first time I’ve been on a sailboat, but it’s the first time to be on one with such a colorful history. JADA, docked at the Sheraton Marina on Harbor Island, is a 65-foot survivor. 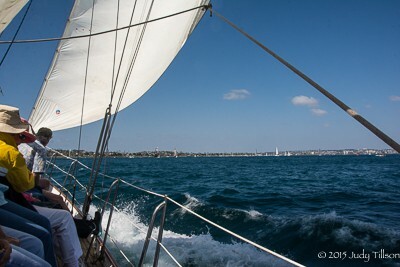 The only authentic classic wooden sailing yacht for charter in San Diego, She was built in 1938 as a graduation gift for a not-so-wayward son. $28,000 at that time translates to over $3 million to recreate her today. Greats like John Wayne, Bogart and Bacall (while they were having an affair and barred from the yacht club) walked her decks. She’s no sissy either. Built to race to Hawaii and beyond to Tahiti, she’s not tethered to the Pacific shores of California. She’s even weathered a major hurricane. A sailboat cutting through calm water in the harbor is a weightless experience. Silent. To be on the water, spirited only by the wind is extraordinary. If only the marine layer hadn’t staggered around the horizon and clung to land like a drunk without a jacket, I wouldn’t have needed mine. It dropped the temps to chilly. I sought sunny spots on the deck to stay warm and watch for whales. The crew served snacks, offered sea-sick meds to those in need, sunscreen, beer, water, sodas and white wine. I stayed with water, no need teasing the digestive tempest that a wake-crashing sail boat could awaken. The enthusiastic crew took turns telling the history of Naval operations on Coronado, Top Gun take offs, the whales and dolphins which the military trained near Point Loma. I had wondered why they trained these ocean mammals and would never, ever have guessed they made guards out of these warm-blooded vertebrates. They train them to scour the harbor and detect deep water divers or mobilized intruders that threaten the military installation. I’d never considered an underwater attack approach threat, but divers, submarines and smaller depth craft could be as destructive as the bombers that leveled Pearl Harbor with today’s technology. 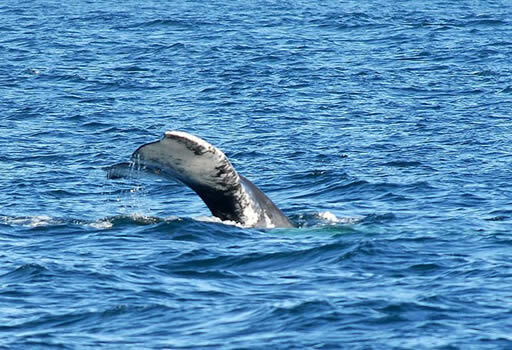 Once we were on the high seas beyond the bay, our whale watch began in earnest. A marine biologist was aboard as part of the crew and made their migration into an engaging story. Because of her, I saw the white spots on the whale’s back not as psoriasis, but scars left from the barnacles that lived until they died there, to become crumbs along the migration trail’s ocean floor. 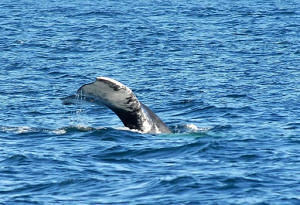 It is stirring to hear a whale breathe, see the spray, feel its exhale, watch its fluke wave as it dives deep. Unleashed power on a south bound migration. We passed by several whales and I was proud the crew didn’t turn the boat and chase them. JADA is a class act. Carole, the owner, visited with us, told stories and topped off a fascinating day aboard a legend of the seas. A day of adventure, interesting people, places and things can be experienced on your own. Don’t stay at home unless you truly want to. I didn’t board or disembark JADA with a date, but it was a wonderful experience I enjoyed as JADA herself became my date. Even if dementia melts it away one day, I will have savored the encounter.